North Lanarkshire Council is Scotland's 4th largest local authority with around 340,000 residents. 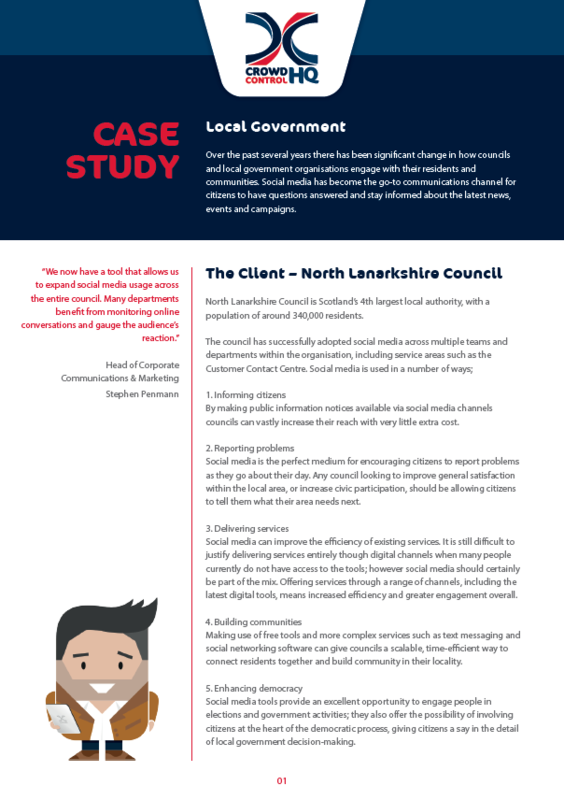 Previously, the council Communications team struggled to respond to all enquiries they received via social media in a timely manner, as the volume of social media activity increased at a rapid rate. Responding to enquiries often required the Communications team to liaise with other departments which lead to long delays, whilst some residents received no response at all. The council recognised the need to provide a better service to citizens on social media, allowing multiple departments to respond to enquiries on social media, reducing the burden on the Communications team. Adopted a joined-up approach to social media management between the Communications team and the Contact Centre team, removing the bottleneck that existed previously. Enabled multiple departments to respond directly to enquiries on Twitter in a controlled way, providing a better customer experience for residents. Gained the ability to monitor and listen to social media conversations that mention or are related to the council. Removed the need to share social media login details and passwords. Download the case study now to read the full story!